2012 Catwoman #0 NM 9.4 Guillem March Cover, The secret origin of Selina Kyle!! 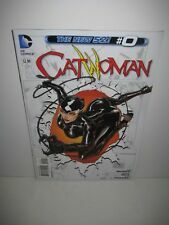 DC Comics The New 52 Catwoman Comic Books 2012 Issues: 0, 7, 8, 10, 11, 12. Catwoman #0 (DC 2012) A cover. High grade condition. CATWOMAN #10 (2012) DC 52 COMICS JUDD WINICK! GUILLEM MARCH! 1ST PRINT!